The NHL has told Brad Marchand to stop licking opponents or the Boston Bruins forward will face punishment. 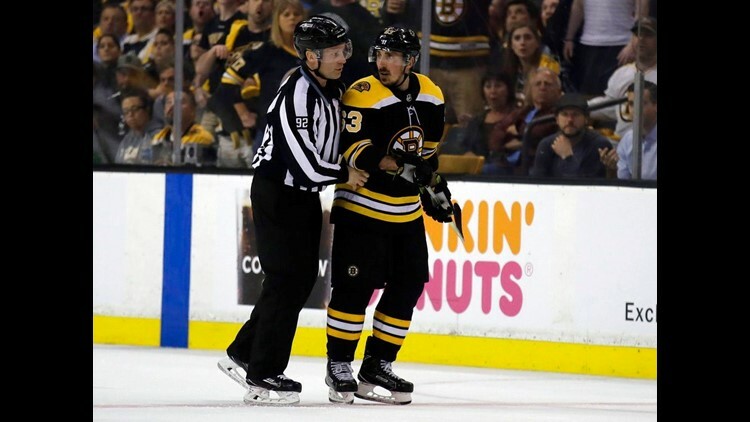 (AP) The NHL has told Brad Marchand to stop licking opponents or the Boston Bruins forward will face punishment. Senior vice president of hockey operations Colin Campbell spoke to Marchand and Bruins general manager Don Sweeney on Saturday about Marchand's actions against Tampa Bay a night earlier. Marchand licked Lightning forward Ryan Callahan on the face during Game 4 of their second-round series after appearing to do the same to Toronto's Leo Komarov earlier in the playoffs. The league says Marchand has been put on notice that his actions are unacceptable and that similar behavior in the future will be dealt with through supplemental discipline. He could be fined or suspended by the NHL if he continues to lick players. "All I'm going to say is there is absolutely no place in our game for that," Lightning coach Jon Cooper said. "I don't get it, I don't understand it. How would you feel if I walked over to you right now and gave you one big lick? Right from the chin all the way up. There's just no place in the game for that." After the game, an overtime loss that put Boston down 3-1 in the series, Marchand said Callahan punched him in the face four times. "He just kept getting close," Marchand said. "Nothing big." Told that Callahan compared licking to spitting and said it should be penalized accordingly, Marchand said: "That's cute. Good for him." Marchand's antics were the talk of rinks on Saturday. Penguins forward Tom Kuhnhackl said it was impossible to avoid hearing about Marchand licking Callahan because it was all over social media. When asked if one benefit of wearing a full face shield was protection from being licked, Pittsburgh's Carl Hagelin said: 'I'm not going to answer that. Funny question, though." Some Winnipeg players watched the game while in Nashville and had a variety of reactions. Jets forward Adam Lowry said he probably would've punched Marchand — the kind of response the known instigator likely was looking for — while coach Paul Maurice said, "It gives me the willies." "It's a play I've never seen happen before in hockey," Jets defenseman Josh Morrissey said. "That's the thing in the playoffs. Crazy stuff goes on and you have to keep a level head." Predators players talked among themselves about Marchand, asking each other what they would do in that situation. "It would kind of be funny, but in the moment it probably wouldn't be very funny," defenseman P.K. Subban. "I'm sure looking back you're like, 'I got licked in a hockey game.' It's just weird, you know?" For all the trash-talking, pushing and shoving that goes on in hockey, especially with the Stanley Cup as the ultimate prize, the line is usually drawn at spitting. Licking is just as unsanitary and, to most players, unwelcome. "It's like spitting on someone. It's extremely disrespectful," Lowry said. "You got to respect your opponents. I get playing hard in a series and there might be some dislike between guys, but there's a certain line that shouldn't be crossed and that's one of them." AP Sports Writers Teresa M. Walker in Nashville, Tennessee, and Jimmy Golen in Boston contributed to this report.